AllThingsDigitalMarketing Blog: September 11th, 2001 – The Day The World Cried. Ten Years Later! September 11th, 2001 – The Day The World Cried. Ten Years Later! Photo below, "The Falling Man," by Richard Drew. Emotionally charged, mixed feelings - 2001 to 2011. From Poet Laureate, Billy Collins' prose commemorating all of the 9/11 victims, "The Names," posted below, to one of the most provocative, unforgettable images by Associated Press photographer Richard Drew, of a man falling from the twin towers, positioned perfectly in the middle. The photo was taken at about 9:41 am on 9/11/01 -- 15 minutes before the 1st building, the South tower, collapsed. Videos would show that the falling man was actually a tumbling man in the air and this is one moment in his time that was captured. Note how perfectly straight, positioned in the middle and parallel to the burning towers the falling man is. 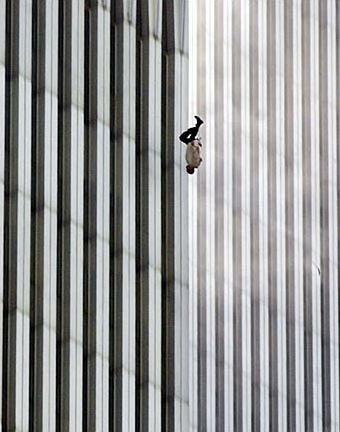 The above photo was branded distasteful and voyeuristic -- never to be shown again, yet the incredible "falling man" is still around. According to many articles and documentaries, there were about 200 people who jumped to their deaths, some were able to be identified only for the victim’s families and to provide closure for them. But there was no time to recover or identify those who were forced to jump prior to the collapse of the towers. We lost almost 3,000 lives that day. I was working on Wall Street( on the corner of Wall and Water Streets). It was a beautiful, clear skied morning. I arrived early as I usually do and was at my desk on the computer when I heard a loud bang and felt rumbling underneath my desk at 8:46 a.m. I shouted "What was that?" Then 15 minutes later another bang, as some fellow employees arrived - initially we thought it was from a missile. Hard to imagine it would be the biggest single attack on American lives. I still keep on asking myself "how could this be?" I was curious and ran outside to see what was happening. As I was walking on Water St. and reached Liberty St., it was at about 10:00 am, I saw large billows of gray smoke, appearing to turn day to night, enveloping hundreds if not thousands of people running for their lives – apparently heading towards the river. I asked some folks what is happening and most were in such shock. With all the commotion, all they could say while they were running was “it’s down, it’s down.” At that moment, I thought another plane came down. I ran back to the office and learned from colleagues that the South tower collapsed (incidentally, this was the 2nd building hit). The North tower (1st building hit) collapsed at about 30 minutes later. And the world would never be the same. I have never seen that photo. It is gut wrenching. What a day that changed all of our lives forever. A day that went down in the books, honestly it`s a very touchy subject to some people and it`s a day that most people won`t forget. We need to honor the people that supported us through the tough times and we need to take care of the people who need it. I was on my way to my job at a volunteer organization. We watched the news coverage on a TV in the conference room. I wanted to close for the day, but the volunteers said no. I think they didn't want to go home--they wanted to be together. It wasn't until I was driving home that night that I heard on the radio the son of one of our volunteers had been killed at The Pentagon (she was not there that day). The photo is indeed shocking, but it has not lost its power.